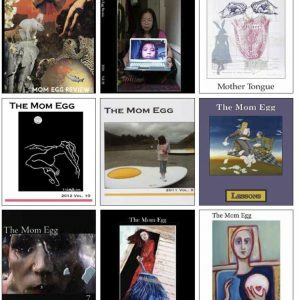 – Katrinka Moore’s third book of poetry, Numa, published by Aqueduct Press, is a departure from her first two books, and like nothing else you’ve read. An epic poem about a shape-shifting creature, Numa tells a fast-paced story, even as it proves a meditation on consciousness, on the primal nature of motherhood, and on how the body shapes identity. tail curled to her chin. This is how we first meet Numa, a young numen, a Roman word for a forest spirit. It is telling that Numa is meant to be a manifest creature whom we follow through the woods as she tries on different forms. But Moore is warning us at the outset, Numa will also be a product of each reader’s imagination. Sometimes Numa is four-legged as ‘wings flap close to her temples’. When a bear shows up, ‘adverse to imitation’, Numa hides as a ‘girlchild raccoon’. Throughout this lovely book, beautiful collages created by Moore illuminate the poems. For example, next to the poem “Scatters”, a photo collage shows pinecones falling in a primeval forest. Moore writes of ‘a small body/within the open world/ unlatched’. Numa, then, can become all things, animate and inanimate, as she undergoes every process of regeneration. I don’t think I’ve ever read a poem with so many fun verbs. Numa careens, ambles, pads, shifts, scratches, trots, forages, frolics, suns. She ‘rises on hind legs / paw-hands grabbing / delicious life.’ It’s as if Moore, a former dancer, is simultaneously choreographing and writing Numa. There is a visual component to the poem that is cinematic—the reader can ‘see’ Numa as she tumbles through the forest in various guises. In Numa, Moore also does a difficult thing effortlessly. Through words, she shows us how thought emerges in a wordless creature. In Moore’s hands, this paradoxical achievement seems as unforced as all natural processes are, as Numa’s existence in the forest is. And it is a sacred forest that Moore calls us to observe, one in which the reader senses Dickinson-like reverberations. That’s because these poems share Dickinson’s facility for compression and precision. They are short poems, in which Moore employs slashes or surprising line breaks. 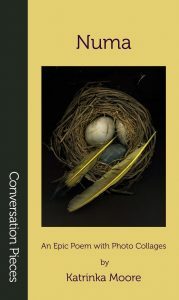 You can dip in at any place to savor the language, yet all poems are interconnected as Numa’s story continues: Numa will mature and mate and give birth. But first, Numa must open herself to the sacred revelations of the natural world. As a shape-shifter and an eternal forest inhabitant, she will repeat and repeat the narrative of earthly existence. Of course, an interloper shows up—isn’t there always one? He seeks a monster. From this point on, there will be parallel journeys—one in which a young ‘hero’ must learn to master himself and one in which Numa must try to keep her mysteries and her cub-child safe. A little about Aqueduct Press: it’s a publisher of feminist sci-fi, and althoughNuma seems to me to hearken back to a mythical golden age rather than project the configurations of future societies, I can see why Aqueduct published Numa under its imprint, Conversation Pieces, which ‘celebrates the speculation and visions of the grand conversation of feminism’. Numa, a sustained vision of our primeval beginnings, will get you talking about where animal and human nature converge and what those implications mean for women. With spare and yet lavish language, this poem does what the best sci-fi does—strips away the artifices of civilization, and makes us re-think conventions. Numa reminds us that the original bond in nature is between mother and child. In the end, Numa becomes the metaphor for the myriad manifestations of nature, as well as for the journey each of us makes through life into death, just another episode of shape-shifting, if the poem “Crossing” is any indication. he loved as a boy. 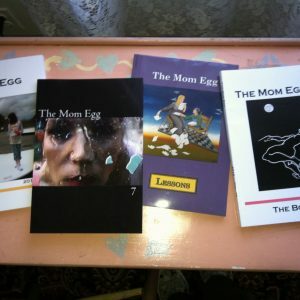 aura Candela has published fiction and non-fiction in The Common. Her poetry has most recently been published in First Literary Review-East andFeile-Festa. She is writing a novel, which won her a scholarship to the Norman Mailer Writers Colony.